Take a guided tour of the Colosseum, including skip-the-line admission, to get the most out of your visit. By exploring the amphitheater’s 1st and 2nd tiers with an official Colosseum guide, who has a background in history, art and archaeology, you’ll learn about the origins of this iconic Rome landmark. Hear stories about gladiator battles and Roman emperors, and marvel at the engineering of the ancient structure. 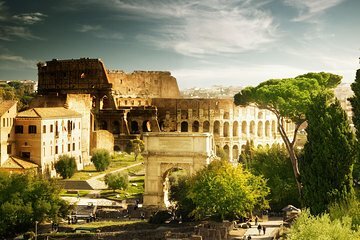 Then visit Palatine Hill and the ruins of the Roman Forum. Tour the Colosseum’s 1st and 2nd tiers with an official guide before heading to the forum. Your guide was a really nice guy and informative! This was EXCELLENT! I highly recommend everyone do this. The guide should not do an English speaking tour guide. She did not know very much English at all. This was a good tour. We spent about an hour inside the Colosseum and then went over to Palatine Hill and the Forum. My companions and I liked the second part of the tour much better than the first. It was much more interesting. If there was a tour of just Palatine Hill and the Forum hint, hint, Viator we said we would do that in a heartbeat. Our tour guide I can't remember her name was delightful. She brought books to explain things and was very informative. This tour was run by Fun Tours and they were great. If you are planning to visit the Colosseum a skip the line tour is the way to go. Otherwise, you can be in a very long line waiting to get tickets to go inside. Good solid tour. Tour guide was a knowledgeable archeologist. Loved the ear buds so everyone can hear and you get info while walking. I would say presentation was a little dry. In addition, the tour guide spoke English with quite a heavy accent, which always makes it a challenge to stay interested in the material. Very informative guides who were very professional and friendly. Tour was easy walking and the guide for the Palatine Hill part was an archaeologist who just had so much information. Such a great place to visit and you will get more from having a guide than walking by yourself. Do it. Taxi took us straight to the meeting point, an agent's office. It is very close to the Metro, in fact the guide took us a few steps through the Metro station to the Colosseum entrance. Practically no delay in entering as we took our turn with other groups. The guide gave a very informative talk as we went through among the columns. My wife is a slow walker, uses a stick, but the guide led us to a lift which bypassed the stairs and we got to the top of the stairs at the same time as the group. We spent just over an hour looking at the arena from several different vantage points while the guide gave us more history and explanations over our individual earphones. We did not do the Palatine Hill which would have been difficult for my wife, but it was easy to leave our group and find our way to the 'on and off again' bus. The tour itself was good, the guide was informative and we had easy access through the colosseum. I think the Palatine hill tour maybe was a bit too long, but overall good. The unfortunate thing was that one of our headsets did not work and when we told the guide, she basically said tough luck. So one of us just had to follow around but could not hear any of the information it was too loud in the colosseum to hear, even when standing close. 2 1/2 tour lasted 2 hours 1/2 hour spent waiting for 2nd portion of tour Palatine Hill and Roman Forum section to begin. Guide for Colosseum was excellent. Sam was very knowledgeable and polite. Guide for Palantine Hill and Roman Forum, Matthew, was rude and included too many unnecessary expletives, not referring to the subject matter. He was knowledgeable about the material presented however, he was more worried about signing people up for different tours instead of focusing on the tour he was giving.